Just like the first time around, this pregnancy too is revolving around sweets. Typically, I would rather have cheese and crackers for dessert, but when those hormones start flowing and that belly starts popping, I’m in love with sugar. As a dietitian, I obviously try to limit my intake of sweets, but I absolutely do indulge in my cravings, especially when that baby is on her way! On our latest date night to Roy’s, our waiter forgot to mention earlier that their famous pineapple upside down cake takes 20 minutes to cook. We really didn’t want to wait that long, so I was left with a hankering craving for that delicious gooey cake. For weeks, it didn’t go away! Nothing would have satisfied this massive need other than the real deal. I found the perfect recipe in the Honolulu Star Bulletin by Betty Shimabukuro. I was sure that it would be the Roy’s pineapple upside down cake I’d been waiting for! Unfortunately, the quantity needed to be altered greatly. I was certainly not going to make 18 cakes! If you’ve ever significantly cut or enlarged a recipe, especially in baking, you’ll know that it’s not as simple as just dividing and multiplying. 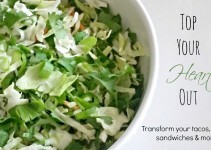 So I thought I’d share the edited recipe with you so you don’t have to do all the work! 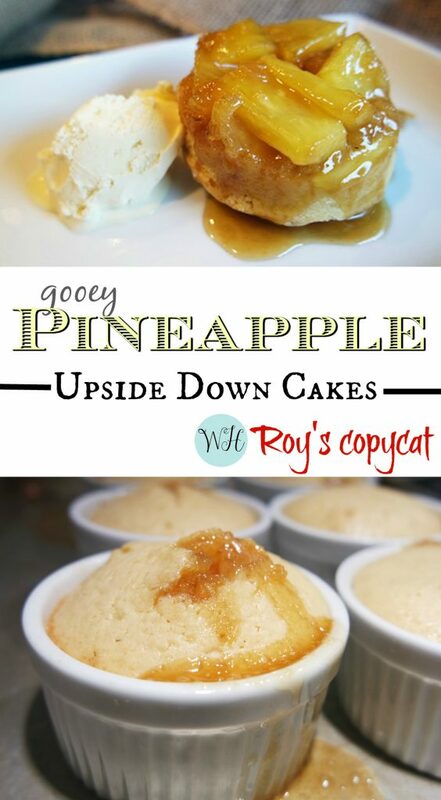 Just as I suspected, the Roy’s pineapple upside down cakes were aaaahhhmazing. All that I’d been dreaming of was here in the warm moist gooey cake paired with cool vanilla ice cream. I’m ready to make these again they were so good and soooo worth the calories! As with any yummy baked good, you’ve got to start with creaming your butter and sugars together. But what isn’t so mainstream is to substitute vanilla sugar instead of plain granulated sugar. What is vanilla sugar? Only the most amazing baking secret! It’s easy. Always keep a separate container full of granulated sugar with vanilla beans inside the same container. Anytime I make something with a vanilla bean, I scrape it for the recipe and then throw the bean pod into my vanilla sugar. It’s heaven. Most anytime I bake, I am sure to grab the vanilla sugar, it just adds a bit of extra flavor into the dish. As you can see below, the white sugar is a bit darker than typical, and that’s why. 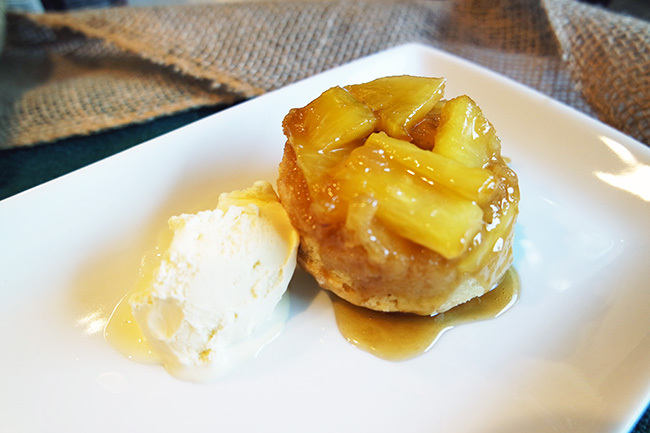 The first layer of the pineapple upside down cakes is a caramel sauce (yum). It has to be made and chilled for an hour prior to the cake being baked. The first photo below is what the caramel should look like. Cut your pineapple fairly thin (about 1/4th inch thick) while keeping the slices substantial (about 2 inches). After the caramel, you’ll layer the pineapple, then the cake batter. After baking, you’ll know its done when the caramel bubbles up to the top. Of course, you’ll want to make sure you have plenty of vanilla ice cream to pair perfectly with this warm gooey cake. You can imagine my heart and how it sank when I realized that my ice cream stock was not as stocked as I thought it was. Learn from me and be sure to have enough ice cream on hand to give everyone their fair share! Enjoy this amazing dessert, you’ll want to make it over and over again! An unbelievably gooey rich cake with a slightly chewy edge, sure to please any palate. Butter or Pam to grease 6 4-ounce ramekins. Into a saucepan, add butter and brown sugar. Cook over medium heat, stirring constantly until the mixture is fully bubbling. Remove from heat. Pour 2 Tablespoons caramel into 6 ramekins. Refrigerate for 1 hour to fully harden. In a medium bowl, beat butter, vanilla sugar and brown sugar together until creamed. 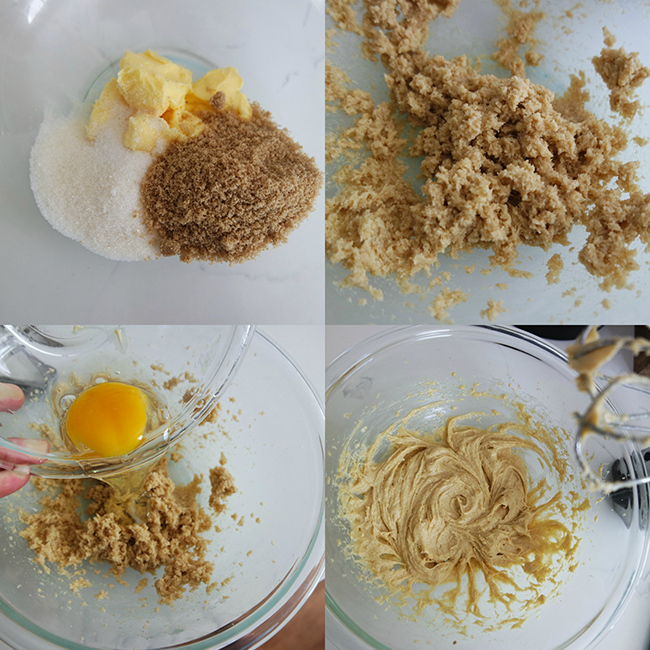 In a separate bowl, sift together cake flour, baking powder and salt. Add the dry mixture to the wet mix and stir just until combined. Fold in milk and vanilla. Once the caramel has set for an hour in the refrigerator, top with pineapple slices to fully cover. Overlapping is okay, but don’t stack the pineapple (you need room for the cake batter). 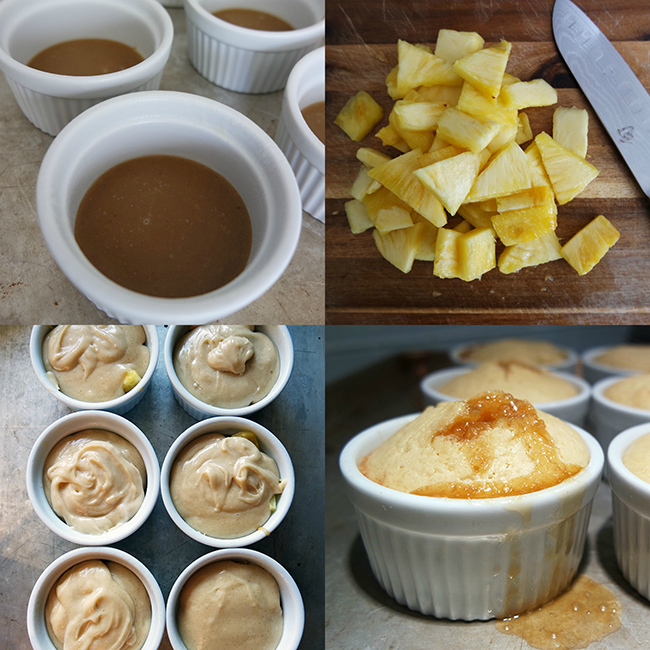 Split the cake batter evenly between the ramekins to cover pineapple, about ¼ cup. Place ramekins on a baking sheet and place in oven. Cook for 20 - 25 minutes. The cakes will be done when you can see the caramel bubbling up. While still hot, run a sharp knife around the edge of the cake. Place the serving plate upside down over the top. Hold both the plate and ramekin while flipping upside down. Gently lift up the ramekin; the contents should release onto the plate. Looks yummy. Thank you for sharing with us at #HomeMattersParty. See you again next week. I loved this article and thought you would too. 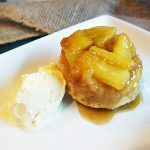 Here it is Roy’s Pineapple Upside Down Cakes Copycat Recipe located at http://www.inwealthandhealth.com/roys-pineapple-upside-down-cakes-copycat-recipe/.